Earlier this year, ATD invited me to be a guest expert and create a series of instructional videos where I share insider tips from my 25+ year career in talent development. In this one, I explain the one powerful question all facilitators must ask. Whether you're facilitating a meeting, a client presentation, or a training or learning session or workshop, you're trying to engage your audience to actively participate. To be a truly engaging facilitator, you want to ensure you invite your audience members to ask questions and actively participate. But HOW you ask for their questions -- that's something I want to get you to think about today. Developing leadership skills (and any other skills) does not need to happen only in the classroom (be it in person or online). In fact, there are many different ways that anyone can upgrade their leadership skills. In this short video, leadership development strategist and CEO of TalentGrow, Halelly Azulay, describes three methods that can help you build up your leadership skills outside the classroom and with no budget. Leave a comment below about your reactions, or ideas about other ways to develop leadership skills. And read more ways to develop skills in creative, non-training ways in Halelly's book, Employee Development on a Shoestring, available at Amazon and everywhere books are sold. Are there diamonds in your back yard that you're not paying any attention to? This short story of a thoughtful gift I received and the meaningful fable behind it will help you focus on the gifts you already have and should be leveraging to become truly rich. I was facilitating a workshop on the three keys to communication success. We were talking about the need to consider the style and preference of the audience in shaping our communication approach when a participant spoke up. Here's what I told him. I’m a life-long learner. I love reading new books. But I’m not much of the fiction, beach reading type of reader. Perhaps to a fault, I always prefer to read books that I can directly learn from, even on vacation. So if you’re more like me, and would like to add to your summer must-read list with books you can learn from, here are five new books from friends of mine that I think you should check out. There’s something on this list for almost everyone. You might have been exposed to the idea of Lunchtime Learning before. Sometimes called Brown Bag Training or Lunch ‘n Learn (beware – that’s a trademarked phrase! ), it’s a short (45-90 minutes) learning session held during lunchtime. What’s so special about these Brown-Bag Sessions, you say? Invite employees to do the teaching, not just the learning! In this post, I lay out the what, who, why, and how of creating a 3-way win for employee development in any organization. On Tuesday, I gave a talk at the Positive Business DC meetup in the suburbs of DC about ways to develop employees outside the classroom and on a tight budget. 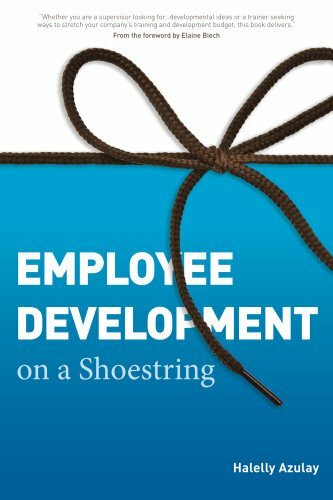 It was anchored in my book, Employee Development on a Shoestring. The audience members were highly engaged and enjoyed the interactive exercises and small group discussions. I'm pleased that this talk has resulted in two different reviews on two blogs, and thought I'd share them here with you. Listen to a short and upbeat interview by ASTD's Ann Parker in which Halelly Azulay discusses why employee development is as important as ever even in the current workplace climate, how to ensure employee development strategies are beneficial to both the employee and the organization, and how to implement good employee development strategies in your organization.